People honoring International Women’s Day on Sunday in Los Angeles. Image via AP. 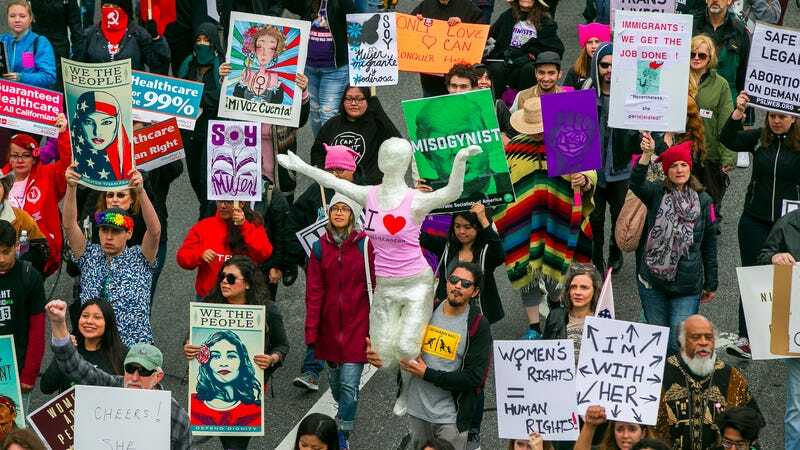 As you may have heard, Wednesday is International Women’s Day, and women around the world will be marking it by striking, abstaining from activities like work and childcare and making different economic choices in order to shift the collective consciousness about the value of women in society. Because we are a world made up of people with very different lives, this day will mean different things to nearly everyone. We’d like to hear how it affected you and those around you: Did you not work? Do more work because more people were out of the office? Go to a rally? Buy food at a different supermarket? Find a man to take care of your children? Did you not go to work but have to take care of your children anyway? Care for someone else’s child? Wear red? Witness something noteworthy or have a noteworthy exchange with someone you know or someone you don’t? Did nothing out of the ordinary happen at all? In essence, we’d like to get as wide a sense as possible of what happens when an experiment of this nature takes place—and what doesn’t happen, too. Feel free to leave a comment on this post, or email us at tips@jezebel.com with the subject line “Women’s Strike.” Please include your age, what gender you identify with, and any other applicable details you feel comfortable sharing about your life to give your experience context: where you live, what you do, whether you’re single or in a partnership, if you have children. And if you’d rather talk, feel free to email us a voice note.